Fix PFN_LIST_CORRUPT Error:- One of the many popular Blue screen errors is the PFN_LIST_CORRUPT Error Blue screen error. The PFN is the abbreviation for Page Frame Number database that consists of lists which represent the physical memory of pages of the Windows system. When this PFN is corrupted, your PC will not work properly through itself and then will arise the Blue screen error. To solve this issue, we have mentioned three different methods in this article and also the most probable reasons of this issue through which you can know which method to imply on your PC. 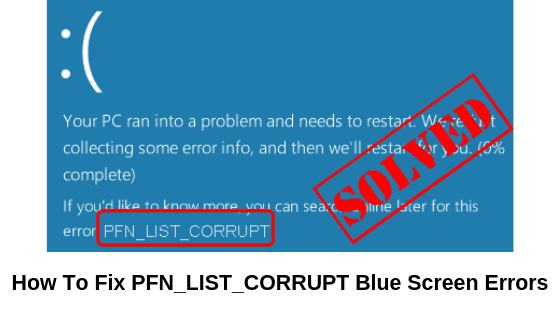 1 How to fix PFN_LIST_CORRUPT? Given below are 3 methods based on the reasons given above through which you can solve this blue screen error. RAM is the abbreviation for Random Access Memory. This is a kind of data storage of Computer. You can check for faulty RAM through the Windows Memory Diagnostic Tool. Step 1:- Press Windows logo key and R Key both at the same time so as to open the Run box. Step 2:- Now type- mdsched.exe and then choose OK. Step 3:- Then Restart and look for problems. Step 4:- The Windows Memory Diagnostic tool will now appear on the screen. Keep it as it is and see for the results a few minutes later. Step 5:– No restart Windows and see if the blue screen error is now solved. This should have solved your PFN_LIST_CORRUPT issue but if not, then you can go to the next method for expected results. One of the most probable reasons for the PFN_LIST_CORRUPT error could be an old outdated driver software. You can, in such cases, solve the error by updating all the drivers of your device. You can update the drivers either manually or automatically. By visiting the manufacturer’s website you can update the drivers for your device. Step 1:- In the Start Menu, Right Click on the Command Prompt. Step 2:- Choose Run as the administrator. Step 3:- Then click Yes when asked by User Account Control. Step 4:- Next, enter chkdsk/f in it and then press the Enter button of your keyboard. Step 5:- The scanning procedure of your device hard disk will now be started to look for any corruption. This will later automatically fix the error. Hope you all found the article of use in solving the PFN_LIST_CORRPUT issue. In case of any doubts, kindly leave your queries in the comment section below. We will be glad to help you all. Keep visiting our page Android Jungles for more such tech related articles or you can also subscribe to our newsletter to receive timely notifications of our posts.